I apologise for my absence and the recent neglect of my blog; however I have a valid reason for this, as over the past week I have been in Russia on a trip with my school. We visited Moscow and St. Petersburg; and despite the bitter weather, the experience was definitely something that I'll never forget. Both respective cities were extraordinarily beautiful in their individual ways. I had a fantastic time doing varies activities such as bartering on the markets; travelling from Moscow to St. Petersburg on the rickety overnight train; visiting the famous Red Square at night; and exploring the iconic Kremlin and multiple palaces. Since my return I have been suffering from a combination of an appalling case of post-Russia depression and the remnants of jet lag, but don't worry; I wont bore you all with my sob story. Long before my trip to Russia I had been lusting after one of Topshop's grey speckled t-shirt dresses; however I was overjoyed to find an exact duplicate in Primark for a mere £10. Since I purchased it it has become a staple in my wardrobe- I'd even go as far as saying that I've practically been living in it. It's quite rare for me to wear the same garment numerous times within the space of a month; but I have to say that this dress broke all of my usual habits. It's certainly a winner in my book! It's ideal for layering and can be worn during pretty much any season. I love its minimalism and simplicity which make it look so effortless; not to mention the mid-length hemline. I hope you're all having a glorious Easter Sunday! I've already consumed too much chocolate for my belly to handle. Hopefully you all attain much more wisdom that I do! You look so pretty in this outfit and that dress is such a steal at £10. Your jewellery totally rocks love. I would love to see photos of your trip to Russia, especially of any Architecture and market stalls. Ohhh is this the dress! Can't believe I didn't know about this one! You look lovely! Will be following! I love your hair and your rings. I loved your purse and your accessories! I love your jewelry, happy easter! That dress is so adorable! Love the jewelry too girl! I am loving your personal style. I love a girl who looks effortlessly put together. Oh! and that gorgeous head of hair... just wow!. Great outfit I love how you have accessorised it...the rings are amazing! Hope you'll post some photos from Russia! I love this complete look & your hair is AMAZING. Thanks for your comment, you have a lovely blog. i am so jealous that you can so easily travel and see such historic places! what an exciting time. i'm loving all your rings, but the eye one is really something! Those rings were so cute! Much love from the SABO SKIRT girls! Your hair reminds me of a lion- in a fantastic way! Beautiful! Love this look! And i totally agree with previous comments..amazing hair!! I love your outfit, especially the coat - which I've been lusting after. You're really beautiful. Seriously love your style. Your hair is insanely amazing. As for your post, you look absolutely wonderful.. Your bag is too cute. Just found your blog, love your style and your outfit is perfect! Plus you like Alice Dellal and Best Coast - excellent!! great casual outfit, love it dear! now following your blog ! Im so jealous of your trip! I've learnt Russian, and would love to put it to practical use. You look gorgeous too, and have the most amazing hair. I love this outfit and I follow you since now! Such an adorable outfit Sarah! I love your jewellery - so cute! You also write the best comments ever! omg your hair looks so amazing! really like this street style look! wow thanks so much for your comment! so kind! and i really like your blog too... your style is great, it's so eclectic and fun! Wow, thank you so much that's sweet ! Russia sounds wonderful! And I really like the dress! I think you styled the outfit really well. Love ur outfit! Esp ur hair! your style is amazing and your hair is awesome!! 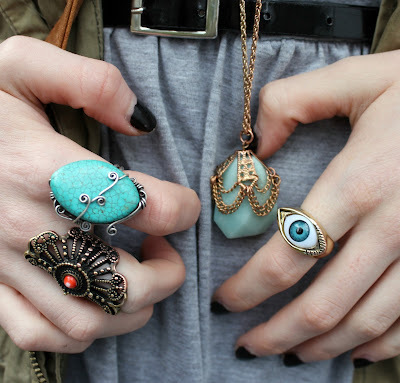 you look so lovely like your blog!your rings are amazing! visit my blog and if you want we can follow each other via GFC! thanks for visiting and for your lovely comment. i'm happy that it brought me to your site. russia must have been amazing, you must share some photos with us. love the outfit!! I've just find your blog! love your style! You are so awesome and I love your hair! and style...I'm your newest follower, would love it if you could check out my blog and follow back? You have the best hair. Amazing! Love ur rings soooooo much! LDN/ MCR fashion, beauty & lifestyle blogger, makeup junkie, gym bunny, foodie, cocktail drinker, bookworm.